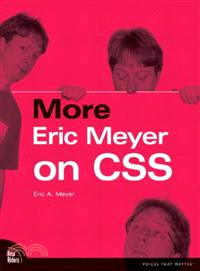 <>Eric A. Meyer has been working with the Web since late 1993 and is an internationally recognized expert on the subjects of HTML, CSS, and Web standards. A widely read author, he is also the founder of Complex Spiral Consulting (//www.complexspiral.com), which focuses on helping clients save money and increase efficiency through the use of standards-oriented Web design techniques and counts Macromedia and Wells Fargo Bank among its clients. Beginning in early 1994, Eric was the visual designer and campus Web coordinator for Case Western Reserve University Web site, where he also authored a widely acclaimed series of three HTML tutorials and was project coordinator for the online version of the Encyclopedia of Cleveland History combined with the Dictionary of Cleveland Biography (ech.cwru.edu), the first example of an encyclopedia of urban history being fully and freely published on the Web. Author of Eric Meyer on CSS: Mastering the Language of Web Design (New Riders), Cascading Style Sheets: The Definitive Guide (O'Reilly & Associates), and CSS2.0 Programmer's Reference (Osborne/McGraw-Hill), as well as numerous articles for the O'Reilly Network, Web Techniques, and Web Review, Eric also created the CSS Browser Compatibility Charts and coordinated the authoring and creation of the W3C's official CSS Test Suite. He has lectured to a wide variety of organizations, including Los Alamos National Laboratory, the New York Public Library, Cornell University, and the University of Northern Iowa. Eric has also delivered addresses and technical presentations at numerous conferences, among them the IW3C2 WWW series, Web Design World, CMP, SXSW, the User Interface conference series, and The Other Dreamweaver Conference. In his personal time, Eric acts as List Chaperone of the highly active css-discuss mailing list (//www.css-discuss.org), which he co-founded with John Allsopp of Western Civilisation and is now supported by evolt.org. Eric lives in Cleveland, Ohio, which is a much nicer city than you've been led to believe, and is the host of "Your Father's Oldsmobile," a Big Band-era radio show heard weekly on WRUW 91.1-FM in Cleveland (//www.wruw.org). When not otherwise busy, he is usually bothering his wife Kat in some fashion.